Then Nās-ca´kî-yēł cut a basket in two and used half of it for a cradle, and he said that people would do the same thing in future times. Women swaddled their babies in soft furs and nestled them in skin-covered cradle boards. 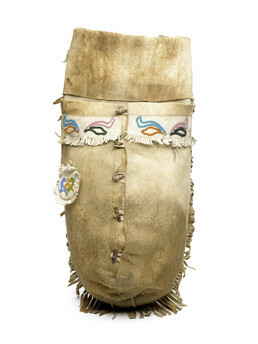 The front of this fringed and beaded cradle is made of tanned hide and the back is covered with spotted deer fur. The small pouch that hangs from the front would have contained the child’s umbilical cord, saved from birth, as well as amulets such as miniature paddles, arrowheads, or earrings. When children were older their mothers hung these amulet pouches around their necks for continuing spiritual protection. Another type of cradle, mentioned in the Raven legend, was made by cutting a spruce-root basket in two.